Lime sulfur is said to be the one thing that will destroy all forms of Collembola and Morgellons. 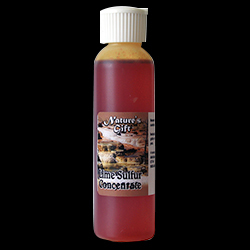 Lime sulfur, in concentrate form, is now available in our on-line store in a five ounce bottle. You can add four ounces to a gallon of water and spray as an environmental disinfectant outside or inside. The extra ounce can be added to a quart of water. However, you want to be aware that if you spray inside, it stinks. Caution: it might remove the finish from anything it is in contact with. So, test it in a small area before doing the larger area. Allow the dog to dry. There are those who report using the diluted solution with the above instructions on their own skin too. If you choose to do at your own risk, you might want to test it on a small area of your skin to see how you react to it. It most likely will make your skin leathery as it destroys the organisms. One gallon should be sufficient for many applications if needed. FDA regulations require me to have you consult with your doctor before using lime sulfur on your skin in case you have a medical problem that it may aggravate. Lime sulfur is not a treatment, cure or meant to mitigate and disease.